Entry Fee: $15 for 1 image, $5 for each additional image. ArtSceneToday.com is currently accepting submissions for our current online International Juried Competition. THEME: Inside Out – Figurative Art that Goes Beyond the External Figurative art that goes beyond the external subject matter…whether it’s someone else or you the artist. This ain’t about your granny’s portraits – we’re looking for your best and most daring work! Open to all media, including photography. Our monthly online competition recognizes excellence in the visual arts among emerging artists from around the world. Artists who are selected as finalists benefit from exposure in a month-long online exhibition on artscenetoday.com, inclusion in the ArtSceneToday Exhibition Catalogue, as well as appearing in FACEBOOK, TWITTER and other advertising venues. 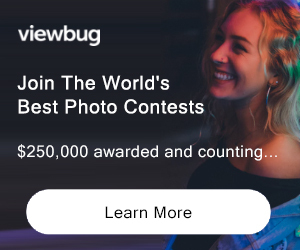 AND all entrants are shown on the homepage during the call-for-entry period before the selection is made…so you get exposure whether or not you are selected. PRIZE DETAILS: 1st Place Winner: Cover artist on the Art Scene Today Exhibition Catalogue and the Featured Artist on the artscenetoday.com homepage for 4 weeks. 2nd Place Winner: Back cover artist on the Art Scene Today Exhibition Catalogue and the Featured Artist on the artscenetoday.com homepage for 3 weeks. 3rd Place Winner: Featured Artist on the artscenetoday.com homepage for 2 weeks. All selected entries will be included in the ArtSceneToday Exhibition Catalogue and appear in the artscenetoday.com online Juried Exhibition section. ELIGIBILITY: 18+ / International Not eligible to enter? - Find contest where you are. COPYRIGHT: The artists keep copyrights to their images. USAGE RIGHTS: By entering the competition, artists give express rights for ArtSceneToday.com to exhibit entries, winners and finalists in any and all ArtSceneToday properties, including, but not limited to: ArtSceneToday.com, ArtSceneToday Exhibition Catalogue, ArtSceneToday Facebook/LinkedIn/Twitter and other social media.